A trip to a local antique shop has made me feel old and depressed. I didn’t realize that the contents of my childhood toy chest made for the inventory of an antique shop. And when did toys from the ’80s become antiques? Oh, I know, it’s when the kids these days started wearing those ridiculous skinny jeans. And check out these prices. Forget investing in blue chips, I should have bought more action figures. My Little Ponies ranged in price from $25 to $48 for a purple unicorn, and the plastic Coke yo-yo I thought was a novelty was priced at $75! Hubby’s Star Wars figures are priced at $15-$25, but what really shocked us was that an original Nintendo sells for $148. Please tell me who is buying a 30 year old gaming system and what are they doing with it? I can barely pay someone to take away my Rock Band set. Maybe I should hold onto it until 2044? The only thing toy that made us feel happy was the Darth Vader Mask. We bought ours at a garage sale for $1 (I wrote about it here) but the antique shop priced it at $80. Grandma’s House or Antique Mall? It also appears that the antique store robbed my mom’s china hutch and my grandmother’s house. They have Oma’s coffee mugs, coffee maker, jam jars, cookware, crystal glasses, etched wall mirror, Royal Dalton dolls, framed needlepoint, glass sculpture, and furniture. I’m not sure how I would feel if I saw all my belongings for sale in a store. An entire set of mom’s china pattern is for sale. It’s the delicate pink flowers and gold trim of Royal Albert’s Lavender Rose. The teapot is priced at $150 and a dessert plate for $9.50. Mom thinks this is outrageous. The store’s website tells me that for the dishes to have value they must have been manufactured in England. If it doesn’t say England, than it’s a China-made new production. And there are the loads of crystal classes. These ones sell for about$4/piece, which I think is inexpensive. Can you tell crystal from glass? My friend has a very clever grandma that takes advantage of people who don’t care to know the difference. She heads to garage sales bright and early, buys all the crystal priced as glass and sell it at the flea market! Read the label. Obvious I know, but my $4 crystal vase still had the label on it. Crystal shines like a prism. Crystal sounds bright. Flick it or run a wet finger around the edge. Crystal makes a pleasant sound, glass is dull. Crystal can be worked thin. Check the rim. We can’t talk about antiques without talking about Singer sewing machines. I’m a bit of an expert these; I watched an episode of Pickers once. Don’t get excited if you have one of these, they aren’t worth as much as you’d like. Singer made a variation of this machine from the 1850s (in the 1920’s they added electricity) to the 1970’s. They were very popular – everyone had one – which makes them not very valuable today. Plus most modern people don’t want a hundred pound piece of furniture (ok – my Singer “featherweight” is only 30 lbs). 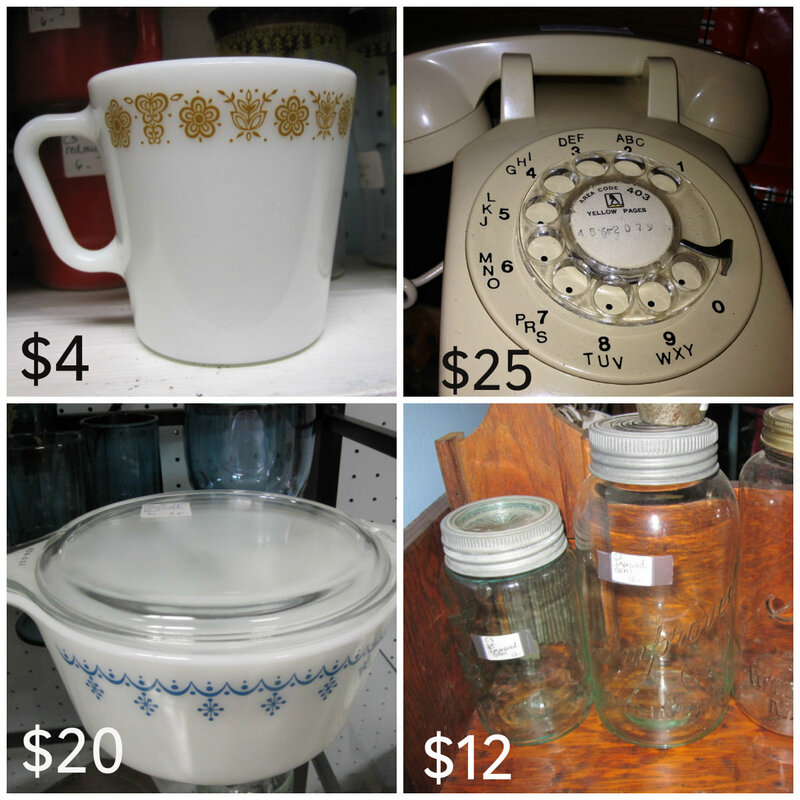 The biggest surprise to me at the antique store was the prices on what I consider old and out of date housewares. 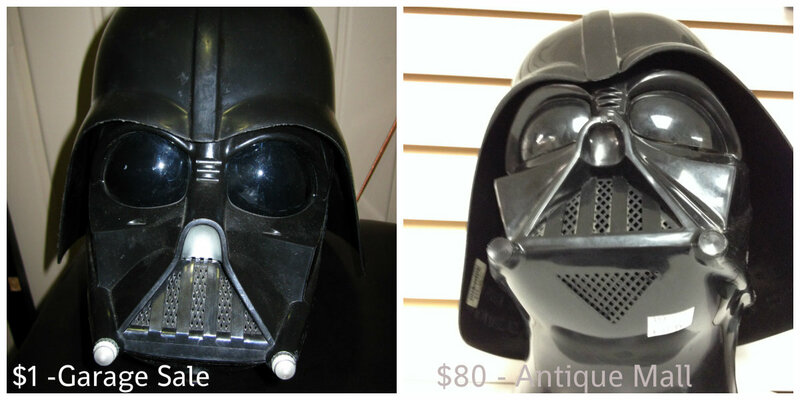 I don’t know who would want these “antiques” at all, much less pay more than a couple of quarters for them. I guess the antique mall is too rich for me, and I’ll just have to stick to garage sales.